Today I’m sharing a post from Dr Laura Markham that I loved, and really helped me see boredom in a new way with my own children, so thought I would share…..
Makes you feel put on the spot, right? You might even feel like you’re a bad parent. Most of us feel responsible when we hear this from our children and want to solve this “problem” right away. We respond to our kids’ boredom by providing technological entertainment or structured activities. But that’s actually counter-productive. Children need to encounter and engage with the raw stuff that life is made of: unstructured time. Why is unstructured time for children so important? Unstructured time gives children the opportunity to explore their inner and outer worlds, which is the beginning of creativity. This is how they learn to engage with themselves and the world, to imagine and invent and create. Unstructured time also challenges children to explore their own passions. If we keep them busy with lessons and structured activity, or they “fill” their time with screen entertainment, they never learn to respond to the stirrings of their own hearts, which might lead them to study the bugs on the sidewalk (as Einstein did for hours), build a fort in the back yard, make a monster from clay, write a short story or song, or organize the neighborhood kids into making a movie. These calls from our heart are what lead us to those passions that make life meaningful, and they are available to us even beginning in childhood, when we are given free rein to explore and pursue where our interests lead us. It’s also essential for children to have the experience of deciding for themselves how to use periods of unstructured time, or they’ll never learn to manage it. One of our biggest challenges as adults, and even as teenagers, is learning to manage our time well. Why does “I’m bored” become a constant refrain for so many kids? Most kids given unstructured time rise to the occasion (after some minor complaining) and find something interesting to do with it. Kids are always happiest in self-directed play. That’s because play is children’s work. It’s how they work out emotions and experiences they’ve had. Watch any group of children playing (outside, when screens are not an option) and they will organize themselves into an activity of some sort, whether that’s making a dam at the creek, playing “pretend” or seeing who can jump farthest. They’re so used to screen entertainment that they aren’t practiced at looking inside themselves for direction. They need some parental attention. All kids need to check in with their parents for refueling during the course of the day. Unfortunately, our society is raising a whole generation of children who are addicted to screens. That’s because electronics (Ipads, phones, computers, game boys) are designed to produce little “dopamine” rewards in our brains as we interact with them. That’s so enjoyable that other experiences pale in comparison. But children need all kinds of other experiences, from building with blocks (motor skills, perceptual abilities) to engaging with other kids (learning how to get along and partner with others) to creative pursuits (becoming a doer, not a passive observer). Children also need to be physically active, or they can’t focus to learn. That’s why it’s essential to limit screen time. 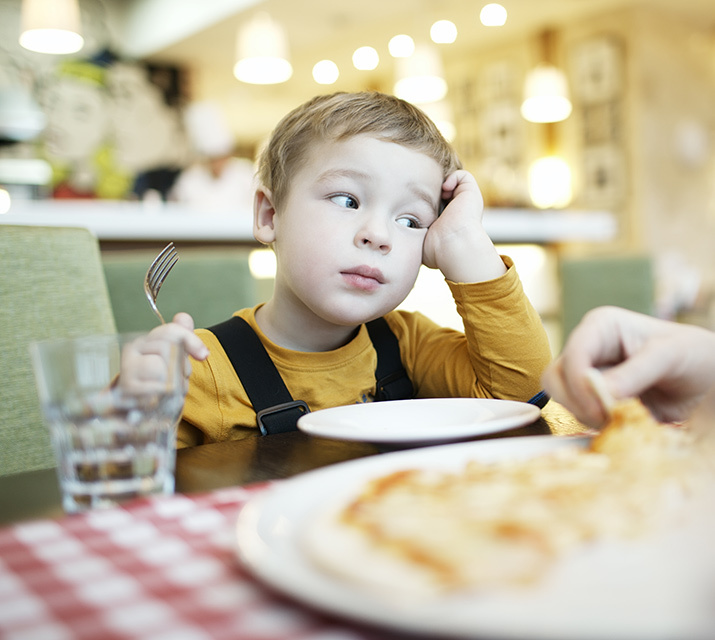 When children say they are bored, how can parents respond? First, stop what you’re doing and really focus on your child for five minutes. If you use this time to connect, just chat and snuggle, your child will probably get the refueling he needs and be on his way fairly quickly. If he doesn’t pull away from you, and you need to get back to work after a few minutes of fully connecting, consider that maybe he needs a little more time with you. Most of the time when children are whiny and unable to focus, it’s because they need more deep connection time with us. Offer to involve him in what you’re doing, or take a break from your work and do something together. Once you’re confident that your child has a full “love tank,” you can revisit the “what to do” question. By now, he probably has some ideas for something he’d like to go do. If not, tell him that figuring out how to enjoy his own time is his job, but you’d be happy to help him brainstorm about possible activities. What about when kids really do need help coming up with a boredom-busting activity? How can we help…while still making them responsible for staying busy/engaged? Even if you need to help your child come up with ideas for “what to do,” shift the responsibility to her by creating a Boredom Jar stuffed with ideas written on pieces of paper. Whenever a child says she’s bored, she picks three pieces of paper from the jar and chooses one of the activities. Here are some examples of ideas that might be in your Boredom Buster jar. Make & decorate a calendar of the summer, with important dates marked. Put juice & cut-up fruit into ice cube trays to make ice cubes. Use old cardboard tubes and boxes to build a marble maze. Make a boat using a plastic soda bottle base & popsicle sticks (use duct tape) for the top, then float it at the pond. Blindfold your sibling & take them on a tour of your house & yard, then trade places. See if you can draw a picture with your foot. Make puppets with old socks, buttons & markers. Mix liquid hand soap, cornstarch and food coloring into paint and paint the bathtub. String beads to make friendship bracelets. Glue popsicle sticks together to make picture frames, decorate. If it really does seem like there is nothing to do, is using electronics and TV ever an acceptable solution? The problem with using TV or electronic games to alleviate boredom is that it is one of those temporary solutions that digs you into a deeper hole. Studies show that kids who regularly use electronics are more likely to feel bored when not doing so than other kids. Even after eliminating the habit, it can take months for them to find other activities about which they’re passionate. But don’t give up — you’re doing their creativity an enormous favor! If your child can read, there is never “nothing” to do. There is a whole world of books just waiting. Of course, you will need to schedule a weekly library trip to find wonderful books. And you will have to “hook” your child on a book by beginning it with her. Choose a book she can read, but might not choose on her own — a simple chapter book, rather than a picture book, for example. Read together until you have to answer the phone or start dinner, but a minimum of a quarter of the book, so your child is hooked. Then tell her it’s time for her read-alone time. It’s her choice. Does she want to keep reading the book you’ve just gotten her into, or read something else? Most kids grab the book and finish it themselves. (If she doesn’t, you may need to drop back a level to a slightly simpler book.) Keep choosing engrossing, slightly harder books. If you need ideas for fascinating children’s books, there are many wonderful lists online including 5 Star Children’s Books. If your child CAN read but has been reading all day and needs a break, and you have just spent half an hour with her and can’t spend more, and there are no playmates around, and your child can’t find anything to do in the boredom buster jar, she needs a special project that she can get passionate about. This is the time to pull out something special you’ve tucked away. For me, it was toothpicks, mini marshmallows and gumdrops, which could be fashioned into wonderful sculptures and of course held special appeal because some found their way into little mouths that didn’t get much sugar. This may be a compromise you wouldn’t make, but every child has something they would find fascinating for half an hour that you can arrange for those emergency situations. If your child cannot yet read, but you are available, there are thousands of wonderful things you can do with your child. You are likely to draw a blank in that moment when your child is whining, so it’s worth making a list in advance. Again, there are many wonderful lists online of parent-child activities. I highly recommend games that are designed to bring you closer to your child, because these will fill his cup, after which he will be more able to figure out what else to do. (They also deepen your relationship, which makes kids much more cooperative and makes you both happier.) Here are some examples: Games to Play with Your Child for Connection & Emotional Intelligence. So those times when there really is “nothing” to do are mostly when your child cannot yet read to herself well enough to stay engrossed for an hour, and you are otherwise occupied. If you can include your child in your activity, your problem is solved. Small children love to wash windows, cook dinner, help you fold laundry, etc. If they can’t be directly involved (for instance, stirring a pot on the stove or cutting the onions), set them up with a child-sized table in or next to your kitchen, give them a plastic knife and some soft fruit, and let them make a fruit salad for dessert. You will never see such a proud child. Or let them “wash” the porch with water while you vacuum inside. Or “clean out” the cupboard where you keep your pots and pans. If you are doing something that precludes your child helping or even being in the same room, such as sweeping up broken glass, put on some music. Most preschoolers and toddlers love music, and will happily dance to it, or march around beating a rhythm on a pot, and singing to the music. Of course, that’s not a quiet activity! But let’s assume you are doing something where they can’t be involved, such as nursing the baby to sleep, and your toddler or preschooler needs to be kept busy and quiet. Preschoolers can often happily occupy themselves for an hour with water or sand (set them up in the bathroom with a baby bathtub of water, ice cubes, pouring toys, etc, or a small plastic tub of sand with small toys), and if you have a monitor, you will be able to hear if he needs you. Another wonderful option is a book on tape or cd. A good one will mesmerize your child, and unlike visual screens, they stimulate the imagination and encourage a love of books and stories. But the real issue with young children is that they need supervision. In such a case, when you can’t supervise them, is it so terrible to put your two or three year old in front of a screen for half an hour? Of course not. Choose a tape that is limited in length so there’s a natural ending to eliminate fights when you turn it off, and to keep your child from seeing commercials. Give your child something to look forward to afterwards (“Once the baby is asleep, you and I will spend some special time together”). And just be sure you turn off the screen once you’re available, rather than taking advantage of it to finish “just one more thing” on your computer!